The wrap around screened porch is one of the first things you'll notice in this best-of-the-old-and-new Nags Head Beach cottage! Nicely decorated & very well maintained, this home retains the character & feel of an Old Nags Head cottage w/ all the modern conveniences. The first floor walls & trim are warmly aged knotty pine paneling. Old-style conversational groupings in the upstairs sitting room & in the first floor living room are great for gathering & sharing time w/ family & friends. Take in the Ocean breeze from the screened porch or enjoy family conversation in the spacious dining room that has a large pine table that can break into modules. It's one of our guests favorite rooms. Easy access & a pass-through from the kitchen to the dining room makes family-style dining easy. This home is loaded w/ old Nags Head charm w/ just the right amount of modern comforts. Ground Level: Parking for 6 Cars, Steps to Entry, Enclosed Outside Shower, Park Grill, & Walkway to the Beach. Mid Level: Warm & Inviting Living Area w/TV, DVD, Pine Walls & Floors, Gas Fireplace, & Great Ocean Views, Kitchen & Large Dining Room, 4 Bedrooms (1 w/Queen, 1 w/2 Singles, 1 w/Bunk Set, & 1 w/2 Singles) 2 Shared Full Baths, & Large Wrap-Around Screened Porch. 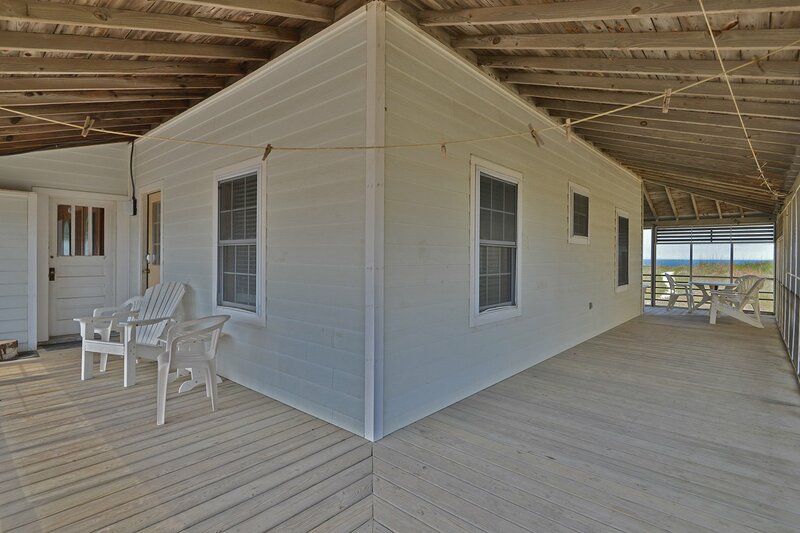 Top Level: 2 Bedrooms w/2 Doubles, Full Bath (Shower Only), Small Den w/TV, DVD, & Laundry Area. Features include: C/AC & Heat, Washer/Dryer, Dishwasher, Microwave, 2 Phones, 2 CATV's, 2 DVD, Netflix, Wireless Internet, Deck Furniture, & Ocean Views. Two Mature Dogs Allowed w/Fees. This is a Non-Smoking Unit. Loved the house and screened in porch. Great house! Thanks for keeping a historic home alive. Love the vintage feel with pine floors, walls, beams, and glass door knobs. Love that you allow pets! !Otherwise we loved the house and location and will likely book for a future stay. Thank you! We enjoyed the house, it's wonderful and the layout is great. Kitchen-wise, we had almost everything we needed but there are no grilling utensils. Great place to gather family for a vacation at the beach. This vintage home is warm and cozy and a perfect destination for a winter visit to the beach. We loved the gas fireplace and the knotty pine paneling and the warm lighting-- it felt like the best of both worlds-- a mountain house set on the beach! Great house! Well stocked and very comfortable. Walking distance to three of the best spots on the beach for food/drinks: Lucky-12, NH Pier & Tortuga's Lie. Nice wide beach & dog friendly makes this place AWESOME! This cottage is all about family time. It has the true cottage feel and is very spacious. Our family of 13 easily enjoyed meals (only eating out twice all week) together around the huge dining table. The adults and kids each had their own parts of the wrap around screened in porch to enjoy each morning and night. Blossom (the d-o-g) enjoyed every minute with us. This cottage is in walking distance to soooo many fantastic places! For a family vacation destination-JJones is the best.